This post is written on the opening day of AdventureX 2017, a UK-based convention that features narrative games. While it does have a strong showing of what you’d consider “traditional” storygames – point-and-click adventures, text adventures, classic interactive fiction – they are happy to talk about any game with a good story to tell. I’ve seen modern-style visual novels, VR IF pieces, JRPG-style games, and one of the biggest guests last year was Rhianna Pratchett, talking about her work on writing on AAA titles like Tomb Raider and Mirror’s Edge. There were streamers, games journalists, devs of all eras and scopes (Charles Cecil! Emily Short!) and hundreds of fans who just wanted to geek out about things they loved and see something new. AdventureX 2016 is the reason why this site and the attempts at making games on it exist. It was one of the best and simultaneously most depressing weekends I’ve ever had. I’m not sure what I expected to find there, but what I did find was a huge crowd of wonderful people, fans and creators both, who were making some really neat stuff. The exhibitors in particular were inspirational; small studios showing off amazing work produced by dedicated, passionate creators. By the end of the first day I was so unhappy. I know that sounds a bit weird after saying so many positive things, but it wasn’t anything to do with the convention. I spent all day with a growing sense of inadequacy. I spent most of my childhood dreaming of making video games but never “getting round to it” (which is a euphemistic way of saying “too depressed”), and that slipped to the wayside and got forgotten. But here was comprehensive proof that I could do it, and could have been doing it all this time. I could have been at one of those tables showing my work off. Of course, things are a lot more complicated than that, especially with my brain. I met a lot of people that weekend who said a lot of very kind and inspirational things. In particular, Georg Hobmeier of Causa Creations was instrumental in improving how I thought about things, telling me that if I was developing, I was a developer, and nothing else mattered. So I decided to develop. I swore that I’d overcome that terrible feeling that I didn’t belong here by coming back with a game of my own. Between apathy, anxiety and Minesweeper it took literally the entire year (that demo build on the Games page was literally uploaded at 7am the day before the convention), but it’s here. Oh, and I did eventually come up with a better name than “Notmare” (which is good, because someone else is apparently using that for real now); The Depths of Ruination Keep is actually, after a fashion, playable. There’s still plenty of work to do before I even think of moving on to another project (it’s still missing a playable build of the final level, for a start), but it is a start, and with any luck there’ll be more to show, perhaps even at a future AdventureX. Oh, and thank you for sticking with this post to the end. 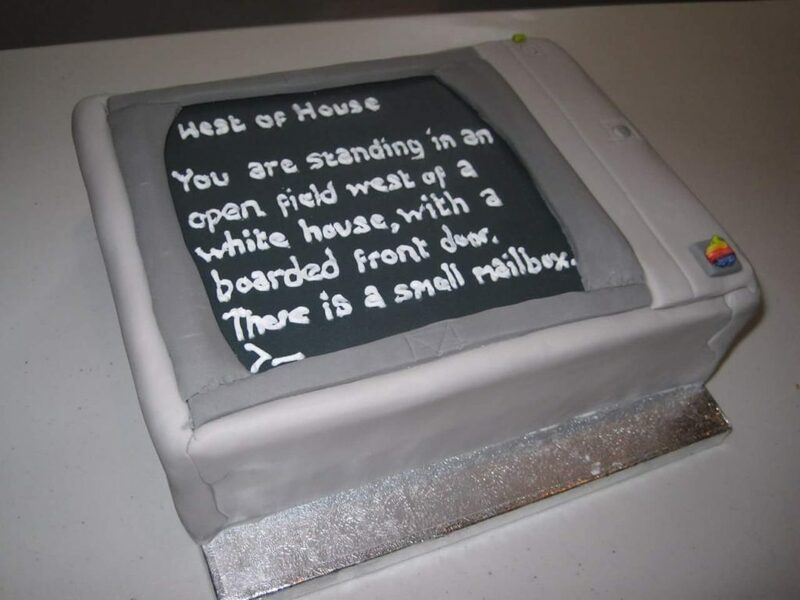 By way of reward, you didn’t think I’d mention a cake shaped like the opening of Zork and not post it, did you?